Touchscreens may have changed the way we interact with smartphones, but they do have one significant drawback. You have to touch the screen... and that almost always leaves behind a fingerprint, formed from secretions of the eccrine glands (water, salt and oils). All smartphone screens have coatings that mitigate against this, generally falling into the lipophobic or oleophobic categories. However, not all coatings are created equal and in this mini-feature we compare the Lumia 900, Lumia 820, Lumia 920 and HTC 8X in the fingerprint test. None of the major smartphone manufacturers release substantive information about the coatings they apply to smartphone screens, other than to say they are designed to inhibit against fingerprints and dirt. As such it's hard to be sure what's being used on what device, but it is fair to say that high end devices tend to perform better in the fingerprint test than low end devices, so there's almost certainly a cost-sensitivity factor. But other factors, such as the material a coating is applied to, can also be important. The screen of each device was cleaned using a microfibre cloth. Two fingers were then touched against the screen, with finger pads flat against the screen, using a moderate degree of force. Each screen was then photographed separately, with the camera and device position constant between shots. In all cases the smartphone's screen was turned off. The resulting photos were cropped and combined to create the comparison images shown below. This first image shows a comparison between each screen, with the only editing being the cropping of the images. 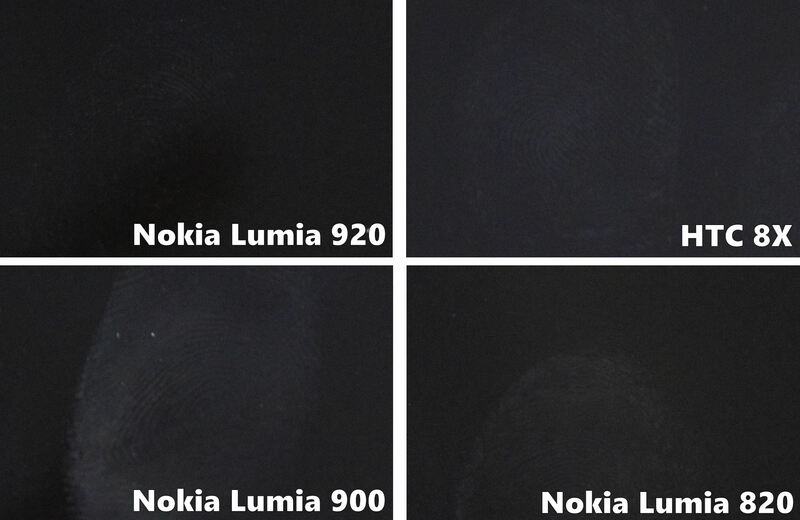 The fingerprints were clearly discernible on the Nokia Lumia 900, much less so on the Nokia Lumia 820 and HTC 8X, and only slightly on the Nokia Lumia 920. It's really only on the high resolution version of the image that evidence of fingerprints on the Lumia 920 can be seen. To help make the fingerprints more visible, we colourised the image (added a red tint) to make the fingerprints easier to see for comparison purposes. 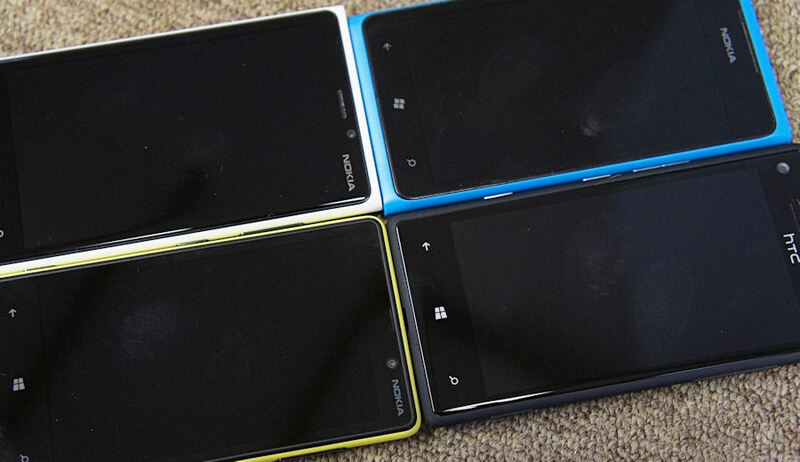 The same pattern as before is apparent, with the fingerprints on the Lumia 820 and the 8X becoming more discernible. The Lumia 900, Lumia 820, and, especially the 8X, gain a reddish background, a result of their screens having a slightly "off black" colour in their dormant state. The Nokia Lumia 920 is a clear winner in first place, and the Nokia Lumia 900 is equally clear in last place, but the gap between second (HTC 8X) and third (Nokia Lumia 820) is much smaller. The difference is close enough to be within the probable errors margins of the test, and, if you do an eyeball comparison between the two devices, then there's very little to choose between them. It's worth pointing out that the methodology used in this comparison isn't particularly rigorous. That's because it's difficult to ensure each "touch" in the testing is the same. Moreover, it doesn't really reflect really world usage, which is made up of many touches, swipes and other touch gestures. However, the results are in line with our experience of using each device over an extended period of time. In this test we've just looked at fingerprints on the screen, but of course there's another area where the fingerprint test can be applied, on the sides and the back of a device. In our experience, the choices of material (and their coating) is the most important factor, but the colour of a device is also important. Some colours show fingerprints (and dirt) more than others. It's not necessarily because they are more susceptible, but rather because the contrast makes it more obvious. Unsurprisingly, white devices tend to show fingerprints more than a black device. Looking at the back of the devices in this test, the Nokia Lumia 900 does well, in large part due to its matte finish, which makes any marks less noticeable. Both the Lumia 920 and Lumia 820 have a gloss finish, which means marks are more visible, and seem to be more susceptible to fingerprints, but has the benefit of being the easiest to clean. The HTC 8X is the worst performer by some distance, with its "soft touch" finish not only having the most visible marks, but also being the hardest to clean.